The following is an interview with John Curington, former right-hand man of Texas oilman H.L. Hunt of Dallas, Texas, concerning the John F. Kennedy assassination. In June 1977 the American tabloid National Enquirer published a story reporting unusual information related by Curington relevant to H. L. Hunt and the JFK assassination. Despite its significance and relevance to an understanding of the JFK assassination, Curington’s story attracted little further notice. Curington himself did not seek further publicity, living quietly in the intervening decades in rural Texas in obscurity as a small rancher and country lawyer. As an illustration of how under-the-radar Curington has been, the most encyclopedic compendium of JFK assassination information available, former Los Angeles County deputy district attorney Vincent Bugliosi’s The Assassination of President Kennedy (2007; 1632 pages print plus an additional 1125 pages of footnotes on an attached CD-ROM), does not mention Curington’s name, according to the index. My interview with Curington came about by accident, through a long-time acquaintance who I belatedly learned is a friend of Curington’s. I had read the National Enquirer article about Curington long ago and recognized who he was. I was surprised to learn he was still alive. This interview is the result. 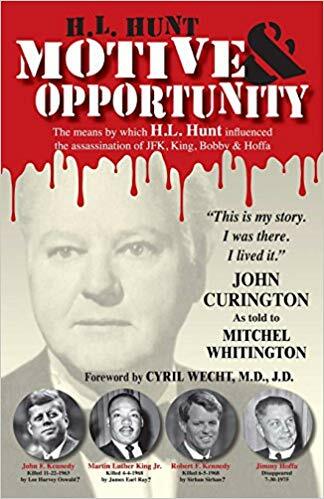 By the time I met Curington he had prepared an unpublished manuscript of memoirs of his years with H. L. Hunt, which went well beyond the brief account inNational Enquirer of 1977. Curington’s manuscript is now published (John Curington with Mitchel Whitington, Motive and Opportunity: The Means by which H.L. 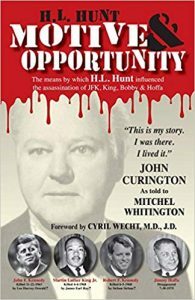 Hunt Influenced the Assassination of JFK, King, Bobby & Hoffa, 2018, available on Amazon). This interview is appearing first onVridar, and to my knowledge is the first publication of a full interview with Curington. Many view the current political climate in the United States with foreboding. I believe it is instructive to recall an earlier time in American history with, in certain respects, parallel issues.